Thunbergia are showy twinning plants. This plant bear heart-shaped leaves with trumpet-shaped flowers that range in different colors. Thunbergia is tropical and thrives in full sun and heat. 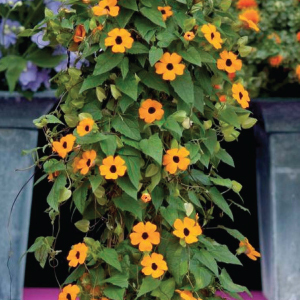 The Susie Orange Black Eye Vine Thunbergia is a stunning bright orange Black-Eyed Susan variety that grows very vigorously.